We need an outstanding scientist excited about analysis close to the experimental lab and international collaboration. We focus on the challenge of extracting structured insight from genome-scale experiments. Besides working with colleagues in the group, there will be a regular exchange with a partner group at the Central European Institute of Technology in Brno, Czech Republic. Classical statistics, probabilistic modelling, or machine learning. Evidence of close collaboration with experimental labs is a clear advantage. 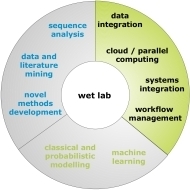 You will be responsible for the development and aplication of modern approaches to data analysis challenges arising from high-throughput experiments. There will be a regular exchange with our partners in Brno. We offer internationally competitive conditions and benefits. The position becomes available early 2014 and has an initial tenure of five years. We look forward to receiving your application. Applications will be considered until the position has been filled and should be addressed to David Kreil. Please include a cover letter, a curriculum vitae, a list of publications, and the names of three referees, who should be asked to send references to us directly. Feel free to please contact us if you have any questions.